British childrenswear brand Mini Boden and The Wind in the Willows spring to life in an interactive installation designed by Dalziel & Pow. In collaboration with the new West End musical adaptation of Kenneth Grahame’s classic story, the ‘pop-up storybook’ featuring E. H. Shepard’s timeless illustrations immerses children in the story and the characters that have inspired the Mini Boden range this season. The installation can be discovered at the London Palladium, where The Wind in the Willows musical opened on June 16th, 2017. Filled with fun, engaging and interactive elements and iconic illustrations, the space creates a 3D world reminiscent of a fold-out storybook scene. Mini Boden brand and product is seamlessly integrated throughout – from patterned bunting and picnic blankets to campaign imagery and a brand movie presenting a day in the life of Toad. The Wind in the Willows inspired collection is showcased on simple wire figures topped with papier–mâché animal heads. We concealed touch-activated audio into the illustrations, allowing visitors to explore and ‘step into the story’. 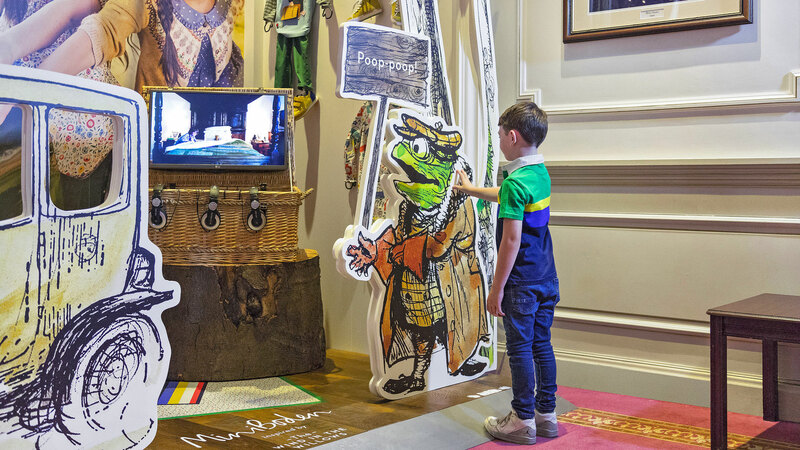 The pop-up was positioned in the London Palladium’s Val Parnell Bar, perfect for children looking to further experience The Wind and the Willows during the intervals and before or after the performance. To direct families to the main installation, Dalziel & Pow also created a stand for the theatre’s entrance lobby, featuring a large-scale hand-drawn illustration and directional cues resembling wooden road signs inspired by the WITW story.